When to Peddle & When to Purge? A common method for relinquishing ownership of chametz is to sell it, typically through an agent (a rabbi), to a gentile. The chametz remains in the house, in a closed-off area (e.g., a closet) that has been rented to its new owner. After Pesach the rental period ends and the agent purchases the chametz back on behalf of the original owner. This option is time-honored and halachically sanctioned. It is, however, a device that some have reservations about relying on for chametz that, on a Torah level, a person is required to remove from one’s possession. The Torah prohibition against owning chametz applies not only to obvious chametz such as bread, pretzels, or cookies, but to any product that contains a chametz ingredient that constitutes a kezayit within that product. Licorice, for example, which contains a significant amount of flour in its dough, would not be sold according to this position but should, instead, be eaten before Pesach, burned, or otherwise destroyed. Such products are considered chametz gamur — “real” chametz. If the food is only safek chametz (that is, there is some doubt as to whether it is chametz at all), it may be included in the sale even according to those pious individuals who avoid the sale of “real” chametz. The foods listed in this chart are identified either as chametz gamur (“real” chametz) and, according to the stringent position, should not be included in the sale, or “not chametz gamur,” and may be included in the sale. Many people who avoid selling chametz nonetheless have a family custom to include their whiskey in the sale. 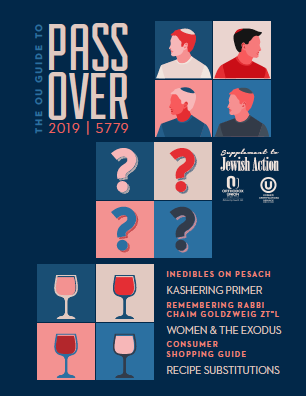 Download the OU Guide to Passover 2019 here.